Malta Maritime Directory :: ICON 250 hull arrives for Tim Heywood designed new construction project. Comment about: ICON 250 hull arrives for Tim Heywood designed new construction project. ICON 250 hull arrives for Tim Heywood designed new construction project. 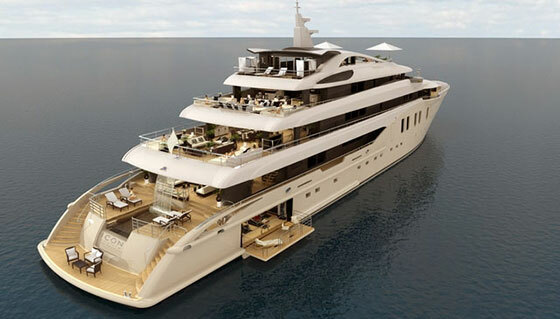 The project is scheduled to complete early 2017 and boasts a number of specific features, such as a low profile engine room featuring five vast guest suits on the lower deck connecting in ICON fashion to a large wellness area and gymnasium opening to a sea terrace. A full size swimming pool with waterfall on the aft deck and extensive exterior spaces make this a true ICON. The timeless lines of Tim Heywood and interior design by Studio Massari combine the best of all worlds. With near enough 1000 sqm owner's and luxury accommodation the layout presented dominates by large spaces centred around a circular staircase with a glass lift. The owner's suite forward on the upper deck with panoramic views connects to a private terrace on the fwd deck. Large cinema and dining area are aimed at entertaining up to 19 guests with seamless transitions from interior to exterior spaces. An extensive array of water toys compliment the two ten meter custom tenders and a third crew tender located in a vast garage in the forward part of the hull with large side shell doors. The project will be delivered to Lloyds and MCA classification.